Part II of Melanie McWhorter's interview with Colombia photographer Erika Diettes, an artist-in-residence for CENTER’s Artist Labs. 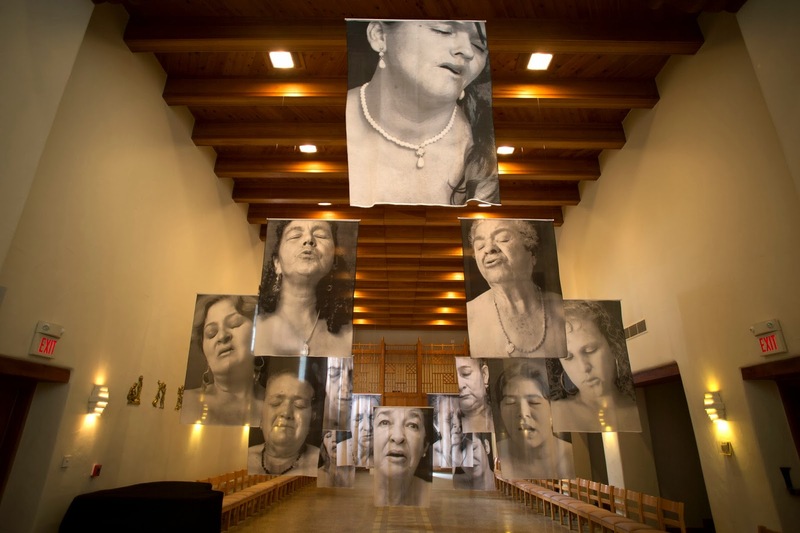 An exhibition of Diettes' Sudarios series is currently on view at the chapel of the Immaculate Heart of Mary Retreat Center, home of CENTER offices. McWhorter spoke with Diettes about her work during the installation in Santa Fe. Read Part I of the interview. Melanie McWhorter: People of varying professions -- like when I talk to massage therapist or school counselors -- talk about the difficulty of carrying other people's weight and that they have to look for ways to find relief afterwards. Do you feel that you need to be a medium for those who do not have a voice? If not, what do you see as your role? How do you deal with some of the weight of these experiences? Erika Diettes: It's definitely hard to sit down and listen to testimonies. I think that I started with Silencios; you start to open yourself to this stage of fragility. You become more fragile. You think it's going to become the opposite -- people think that you just build this hard shell and it's the contrary -- it's definitely the opposite. It's like walking with your raw skin. Sometimes you feel like you have heard the most horrible story that you could ever hear and then you meet somebody else and -- I don't want to count -- but there's always something more horrible than what you already heard. So it is difficult, I'm not going to say that it's not hard, it is extremely hard. But at the same time it is extremely empowering. When you meet one of the women of Sudarios, when you see their strength in front of you giving that testimony and when you see the way they keep going with life and when you see the power that they have because they are very strong women. The first testimony that I heard from the Sudarios series I could not ever imagine how you would recover from something like that. It was a woman who had to witness -- who was forced to witness -- how they killed her mother, how they took out her eyes, how they cut her tongue, and the perpetrator told her you have to open your eyes because you have to see. You see this woman giving you that testimony and you see that she has two daughters and she keeps going with her life, obviously in a very hard way, but she still goes on. When you are witness of that you think, "I have no reason what so ever to complain, I'm just very grateful that I get to be a voice, I'm grateful that my work actually serves a purpose." So I just feel-- I guess the right word would be honored. I feel very honored and grateful to them for allowing me to be this bridge that connects the stories from these areas of Colombia. Of course we know where they are located but we really don't know what they look like. In Colombia when you are in the cities, when you live in Bogotá or in a big city it's like you really don't understand the dimension of the countryside, it's like it's two different countries. So I think for me to be able to be the bridge that connects these two places -- and I don't mean like physical place, but I mean like all the cultural and all the spiritual things that go in each place -- I think I just feel honor and that gives me the strength. I started the Rio Abajo project without imagining ten percent of the dimension that that project was going to have. I had no idea when I started that. So I think one thing fits the other, and it fits the other and it just makes it bigger and bigger and bigger, because I truly believe that we all need to be acknowledge, and I think these art projects sort of does that for these regions. And it's not only about talking about the violence but about talking about the strength also, it is very sad and it is extremely hard, but I just feel this incredible strength to also do something about it and the only thing I know is how to take photographs. I don't know how to do anything else. I will not be able to do anything else -- I don't know how to do anything else. My true passion and my love in life is photography and I feel very blessed to have found a way to express and represent something that is unrepresentable in a way. Because there's really no way of representing the dimension of the horror that they go through. I think that these are exercises or intents to do that, but there's no real way to that sort of understanding. But I guess the only thing that I can do is photography and I'm just very happy that they find my photography as a valid place to show their pain to the world. So I just feel very empowered. MM: Finally, since we are sitting on the CENTER campus in the IHM Retreat Center Chapel, where your work Sudarios is hanging, tell me why the installation and materials of each project is so important. Will you describe how you install works from Drifting Away and Sudarios and tell what experience that you are trying to create as a curator of your own work? ED: I think nowadays we are in a very fortunate moment. If we think about technology we can do whatever we want, there is technology that can solve any problem. I think that the limitations are our ideas, because everything can be done today. You name it, there's a place in the world that can do it. We have to think beyond regular medium, traditional medium, but I think that you need to understand what materials you really need to tell the story. If you have your story very clear, you will feel the materials that are absolutely necessary for that. Like for the Rio Abajo project, I was really obsessed with the idea of the river, and the idea of fragility of life; how can you put that together? I had the elements of how do you represent a person you cannot photograph, that was the first question. I started to think, OK, what do people keep of the person? Mostly they always keep clothing, and that also has a very-- of course it's a symbolic reason, but there's also a very utilitarian reason. What if he comes back? He needs his clothes. So they always keep his favorite shirt -- it's not any piece of clothing, it's his favorite thing. In other cases it's "He looked so handsome in this shirt" so that's the shirt that they keep. You have to keep into account that many of these families are also displaced from their original house so they have to leave that house with what they can grab and they always will keep something of that person in case he comes back. So I decided that the clothes was the way to go and then I needed the river. So I said, we need water, I literally wanted to put the clothing in the water. But then what material would make sense for this representation? So those images are printed on crystal, and when you see the installation it's really heavy pieces, they are as tall as I am -- they are very large pieces, they are heavy, but they are very fragile. You can do that in plexiglass, you can print in plexiglass, but then it wouldn't have the weight of the stories, which is why I chose to print in glass. It makes it heavier, it makes it more difficult to ship, you need more insurance, but that story would not be complete if you did not have the crystal element. It's something that needed to be done that particular way. Of course it took me many proofs to get the right color and right printer, but if you give your project the time-- it needs its own language. It has to be spoken perfectly. You need to have the symbolic element but you also need to find the medium to fit the symbolism that you're trying to look for. The Sudarios images on the other hand, it's like the opposite. They are very weightless images. They are printed on silk and they are called Sudarios because 'sudario' means shroud, and in some religions they wrap bodies in white linen, and that linen is called sudario. If you look in the Catholic religion, the sudarios is the place where Jesus' face was last imprinted. I really wanted to give the idea to the spectator that these women are ghosts. You see them floating in the church and you see them going to heaven. The way I install the work, there's always one image that is higher, it's like it’s ascending to heaven. I had the intention of that because in the many testimonies that I have heard there's always this idea -- and these are just literal words, I'm not making them up or interpreting anything -- that after the encounter with violence they are left dead in life. So I want to capture that because these are portraits of people who are alive, they are all still living, but they told me that they feel that they no longer belong to this world, after witnessing that violence it's like they are dead but they have a pulse. I think the perfect element for that was the silk because I wanted the images to be translucent and ephemeral, to have that ghostly appearance. So I think as an artist you have to look for the language you need to speak in that particular moment. And there's the technology available -- we can definitely do whatever. It's an amazing moment to be a creative person because there are thing to be done -- things you can do -- you just have to have the ideas for it. Maybe you just have to be patient. The Sudarios images are twenty images, but I had to print -- I think it was 97 proofs before I was able to get the color right, before I was able to get all of them together looking the same. I mean, it was insane, the number of images I printed. But you have to be patient, you have to be obsessive! You can get it done, it is a question of time and effort. You really have to commit to the effort of it! Visual Artist Erika Diettes lives and works in Bogotá, Colombia, exploring issues of memory, pain, absence and death. 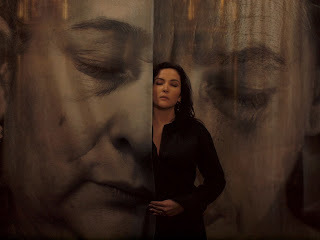 Her most recent work, Sudarios, was showcased in the 2012 Fotofest Biennal, the Festival de la Luz in Buenos Aires, the Ex Teresa Arte Actual in Mexico City, and the Ballarat Foto Biennale in Australia, among others. Diettes' photographic works are part of the permanent collection of major museums, including the Museum of Fine Arts Houston, and has been exhibited at the Museums of Modern Art of Bogotá, Cali, Medellín and Barranquilla; the National Museum of Colombia; the Museum of Contemporary Art in Santiago de Chile; the Museum of Fine Arts in Houston and many more. Diettes received a Master’s degree in Social Anthropology from the Universidad de los Andes and has authored several essays on artistic representation in times of war that have been included in books, newspapers and journals. 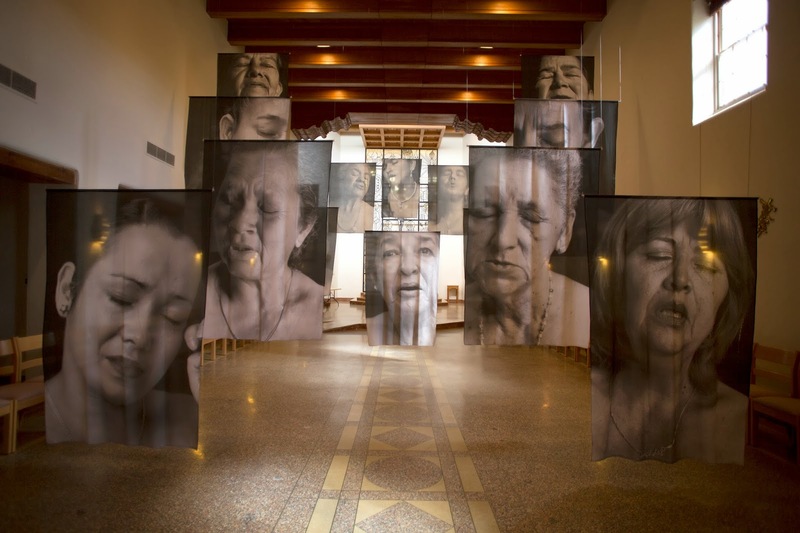 Her photographs have been exhibited in unique spaces linked to re-memoration processes developed by victims’ movements in Colombia. Read Part I of Melanie McWhorter's interview with Erika Diettes. 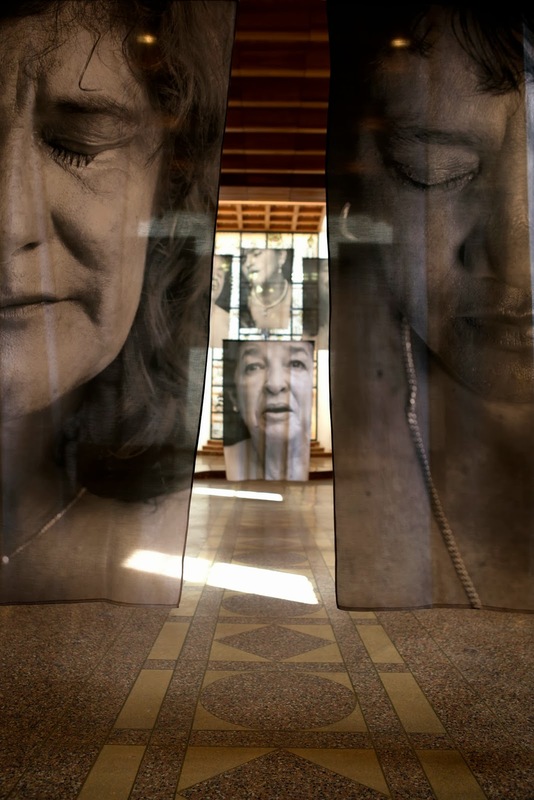 Diettes' installation of Sudarios will be on view at the chapel of the Immaculate Heart of Mary Retreat Center through October 24th. Copies of Diettes' books, Silencios, Drifting Away (Rio Abajo) and Sudarios are available at photo-eye Bookstore.